Girls, oh girls, boys will never understand why we always have to look nice. Some days, we can’t decide what to wear because we have so many outfits to choose from. And there are also days when we have a hard time deciding what to wear because we have nothing to choose. And this post, my friend, is all about the latter problem. If you have nothing to wear for a day, try out this one. Your ordinary jeans, (be it ripped, bleached, or just your plain old jeans it won’t matter.) then if you have a plain, white, v-neck shirt, this is the perfect time for you to use it. fold the sleeves and tuck it in your jeans, belts are optional, whatever you prefer. For the shoes, chose a bright one for a splash of color, be it Converse, Keds, Vans or even flats, it just have to be bright. you don’t want too much attention, but a little of it won’t hurt, right? 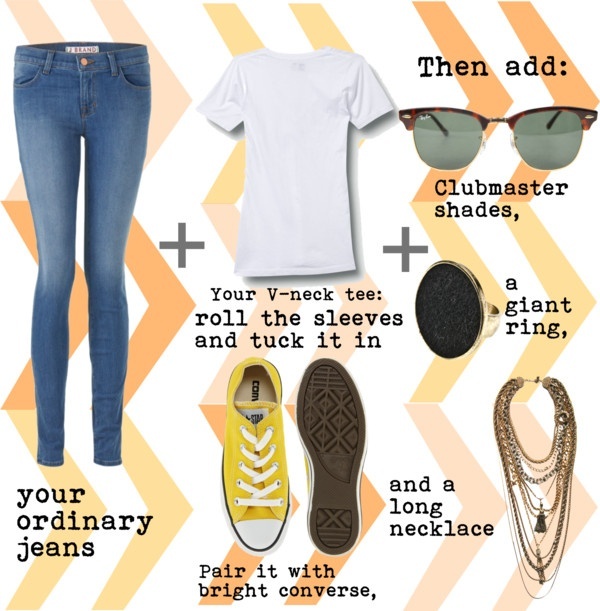 Then add your favorite Sunglasses (I prefer a Ray-Ban clubmasters, just because they’re my favorite. haha.) a long neckace, then finish it of with a big ring on your index finger. So stack up a few closet staples and you’ll have endless outfits to wear now and forever. But when you bought twenty “in” outfits today, chances are, you may end up having nothing to choose years from now.